My postdoctoral contract came to an end last year at the end of September, and I had made the decision already quite a long time ago that I would not apply for an extension. I have been doing more or less the same in astronomy (namely asteroseismology) for the past ten years, and I wanted to move to a new field, where I can deal with more practical issues, and contribute to more burning problems of our society. I never regretted choosing astronomy as a profession, it was my childhood dream, and I got nice achievements in the field, but I have no regrets stopping and starting in a completely different topic. Change can be a good thing. I had a very nice goodbye reception with more than a kilogram of M&Ms, three cakes and a lot of other snacks, so everybody was happy (with the food, not with me leaving), and I even got some presents from my colleagues (among others two Star Wars themed LEGO sets). Since I am still co-supervising a PhD student (and that is something I still really enjoy, so I don’t want to stop with it) I have kept my affiliation (and staff card) as a voluntary (unpaid) research fellow at the university (for which I am grateful to my old boss), but that changed nothing in the fact that I became unemployed in October. Thanks to the very generous Belgian social security system (we pay those high taxes for a reason after all) I did not have to rush into a new position, so I had time to look for jobs that would really match both my skill set and my interest (and the fact that I really did not want to commute to a job outside of Leuven). I definitely took my time. I used October to just relax and – as already mentioned before – just bike as much as possible. Luckily the weather was still great, so I could really make the most out of the month this way. By the end of October I had satisfied my biking needs to the full extent, so I started browsing the job market more actively. I got myself a job coach who helped me organise my thoughts about what kind of job I would like to do, and who also gave some useful tips on how to organise my job search and how to prepare for an interview. I set up some very specific keywords on the website of the VDAB (the Belgian unemployment office), so I would receive only relevant job offers, and of course I refined my linkedin profile too. I also attended a job fair aimed especially at people with a PhD, but that was more of a networking practice than anything else. 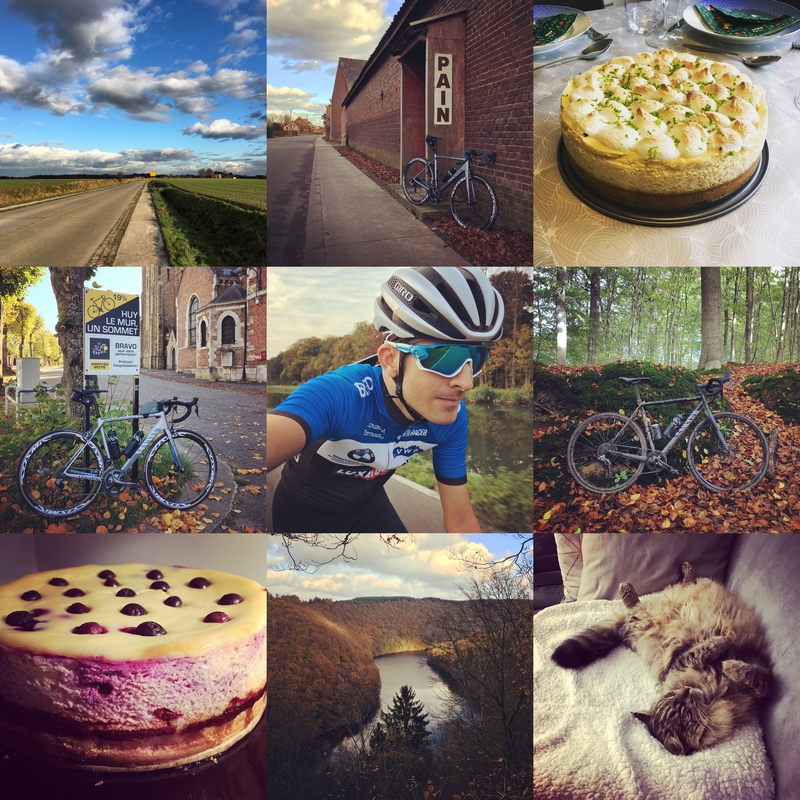 In the beginning of November we went to the Ardennes for a few days where we had the nicest Belgian hike so far (around the branches of the river Ourthe), and surprisingly we still got enough warmth from the sunshine to eat pancakes on a terrace. Besides the job search, I still had quite some time do do other things. Of course while I was unemployed I did all the groceries, cooking (with my speciality being a delicious Pad Thai), and cleaning around the house. Whenever the weather allowed I also went cycling (for example for a nice 100 kilometre loop between Namur and Huy), and on the late evenings I played either FIFA (my biggest achievement this year is the treble with Liverpool on World Class difficulty), The Legend of Zelda: Breath of the Wild (a really great game on the Nintendo Switch), or Cities: Skylines (a city building game). Hoping to get more group rides next year I joined the Vlierbeekriders cycling club (because with Squadra Tornado people are way more racing oriented, so during the good weather months everybody is off to races on the weekends and there is nobody left to do long rides with). I have to say that by December I started to get a bit bored at home sometimes, so I got really excited when one day I found a very exciting job opening in my mailbox. It was a junior researcher position at Transport & Mobility Leuven to contribute to both national and international research projects within the area of transport research (e.g., work out adequate solutions for critical mobility issues, making use of state-of-the-art transportation models, evaluation techniques, statistical analysis and data collection). Not only was the job-description interesting, but it was also clear to me that I am a very good match, so I immediately knew that this was the job I want. I also realised that I actually know someone at the company (from cycling), so I could use this connection to get to know more about the work and atmosphere at TML. The things I had heard made me even more interested, so I sent in my CV and motivation letter on the 19th of December. The application deadline was at the end of the year, but I already got a reply on the 4th of January, in which I got invited for an interview. The only one I had before was for my PhD, and it was with people I already knew from my ERASMUS stay, so I did not know what to expect… So my first real “corporate” interview was on the 9th of January, and it went very well. It took 1.5 hours, and we talked about a wide range of topics (in English), ranging from what I did during my academic career to my favourite problematic traffic situation in Leuven. I even got to talk about my star atlas project. All in all I came away with a very good feeling, wanting the job even more. Ten (very long) days later I got an email that they decided to hire me! I was so happy that I wanted to go and high-five Filou (after calling Clio and telling her the good news), but he did not really understand why I am jumping around in the living room :D That evening I was official to the yearly dinner of the Institute of Astronomy, so I got to celebrate with champagne too :) I signed my contract on the 22nd, and started working already on the 1st of February (by bringing two home-made cheesecakes, since it was not only my first day but also my 33rd birthday). I have a lot to learn, but it is very interesting, so I am convinced that this is the beginning of another exciting chapter in my life! This entry was posted in Uncategorized and tagged cycling, interview, job, tml, unemployment, work on February 11, 2018 by Péter I. Pápics.